The Fuller Center of Macon, Georgia, overhauled a home for a Navy veteran whose home was so dilapidated that the only running water he had left in his home was in his bathroom sink, which he used for everything from bathing to washing clothes and dishes. The Macon Telegraph newspaper had outstanding coverage of the dedication as you can see at this link. We produced and released a video documenting the 2015 Millard Fuller Legacy Build, which concluded earlier this month in Shreveport, Louisiana. You can watch it here. The Fuller Center of Central Indiana had a huge weeklong event in Speedway, Indiana, where several IndyCar teams built a home for a veteran and his family. The event garnered coverage from local TV stations, racing websites and even made ESPN. You can see much of the coverage at this link. The Fuller Center of Central Indiana also had a two-week home build in the Old Southside area, which many believe will be a catalyst for much-needed revitalization in the area. See coverage from WTHR-TV from the beginning of the build here and then read The Southside Times’ report on the conclusion of the build by clicking here. We got great news from the United Church of Christ, which has the goal of building 50 new, safe, permanent homes in earthquake-ravaged Nepal by funding the construction of Fuller Center homes there. Read the special report about their partnership with us by clicking here. The Fuller Center is on a mission to build 200 new homes to help the people of Nepal. We also had our first Global Builders team to work in Nepal since the earthquake. You can see photos of them in action here. A newspaper that covers news from Armenia has this report on team of college students from various countries that volunteered with our Fuller Center partners in Armenia to build homes in the Dian Village of the Aragatsotn Region. You can read the report here. You can also see great photos from the students’ work here. Another Armenia news outlet has this update on Fuller Center Armenia’s continuing, very productive relationship with VivaCell-MTS. 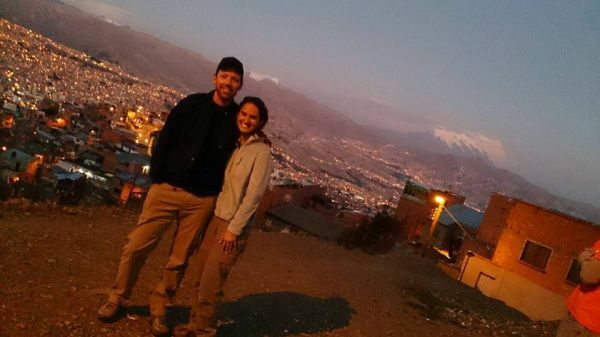 Our new Fuller Center partners in Bolivia are doing a great job of spreading the word about their work and volunteer teams are loving the experience of working there through our Global Builders program. This is a project that’s really going to take off and already is on solid footing. Click here to see footage of our partners spreading the word on Bolivian television. You can see photos of our Global Builders in action in Bolivia by clicking here. Our Bicycle Adventure held its second annual two-day fall ride on the Silver Comet Trail in Georgia, a ride that pushed the 2015 Bicycle Adventure fundraising total to a record $267,591! Thank you to our cyclists and everyone who contributed to their fundraising efforts. See a video from the Silver Comet ride here. Our covenant partner in Henry County, Georgia, received some great coverage in their local newspaper of a major rehab project. Of course, that’s just a sampling of what’s going on with our work. To find out what the Fuller Center covenant partner closest to you, find their information at www.fullercenter.org/locations. And be sure to like our Facebook page.